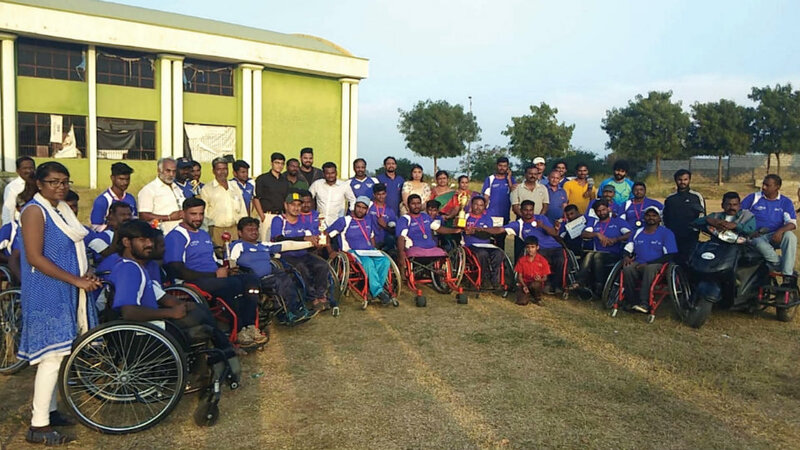 In the final match of the three-day South India Wheelchair Cricket Tournament held at MUDA Sports Ground in Vijayanagar 1st Stage on Nov.18, Mysuru team beat Bengaluru by three wickets. Four teams — Bengaluru, Mysuru, Bagalkot and Kerala had taken part in the tourney (12-over a side) organised by Bengaluru-based Divyanga Maitri Sports Academy in association with Vikalachetanara Abhyudaya Seva Samithi, Mysuru. The winning team — Chandru Kumar (C), Shankar, Anand (WK), Prabhuswamy, Madhu, Chandrasekhar, Jagadish, Nagurvali, Ravikumar, Nagareddi, Azgar pasha, Syhad and Shahabuddin — is seen posing with the trophy.